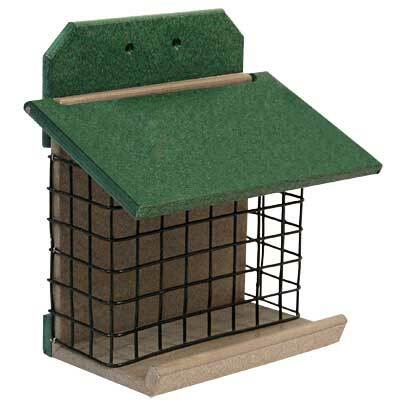 Invite squirrels to feed at their own station in your yard with this Songbird Essentials Green and Brown Squirrel Feeder. This specialty feeder is perfect for providing a treat to squirrels, perhaps keeping them occupied and away from your bird feeders. The front, vinyl coated black cage accommodates 1.75 quarts of peanuts in the shell, or can easily hold a large seed cake. The 1" square grid allows squirrels to reach the treat, and a lip on the front of the unit creates a resting spot for these animals. More enterprising squirrels may learn to lift the roof, for you to enjoy their antics. The dark green and brown color scheme enhances your backyard, and its flat back attaches to a post or tree with ease. Durable, recycled plastic lumber creates a hardy piece, adding an environmentally sound look to your garden while reducing landfill waste. Provide squirrels their own food source with this Green and Brown Squirrel Feeder. Made in the USA. Lifetime guarantee.